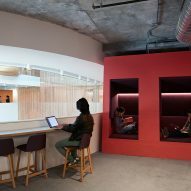 Home rental website Airbnb has taken cues from its listings around the world when designing additional office spaces at its headquarters in San Francisco. 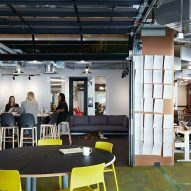 The Airbnb Environments team collaborated with local architecture firm WRNS Studio to redesign the warehouse-like structure at 999 Brannan Street – an extension of the company's main office at 888 Brannan down the road. 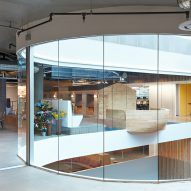 The existing building was stripped down to remove every non-structural element behind a curved wall made of glass cubes, which wraps around the exterior. 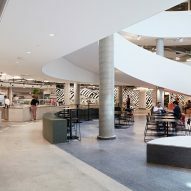 Inside, a large spiral staircase circles an atrium, which washes white walls and a polished concrete floor with plenty of natural light. Each of the building's four storeys takes a different city as a theme. Colours, patterns and materials from Buenos Aires, Kyoto, Jaipur and Amsterdam are all incorporated into the design of the levels. 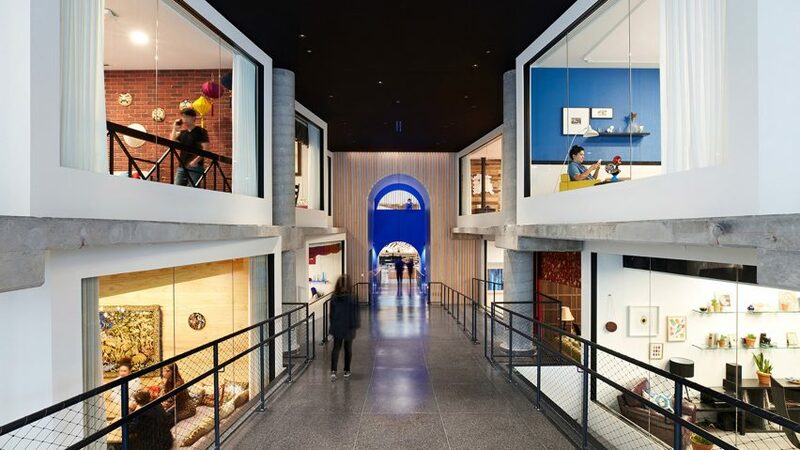 "999 Brannan's design reflects Airbnb's Belong Anywhere ethos by incorporating elements of its global community into the design of the space," said the company, which was founded in 2008 by Rhode Island School of Design graduates Joe Gebbia and Brian Chesky. 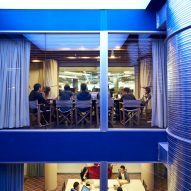 In addition to themed floors, the decoration of meeting rooms is influenced by individual Airbnb listings around the globe. One room mirrors an English castle, with matching green and red tufted Earl Sofas and Victorian window treatments. 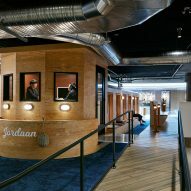 Another office space takes design cues from an 1880s jail in Montana, and features a wood-burning fireplace, and rustic pieces like hanging lanterns and animals skins. 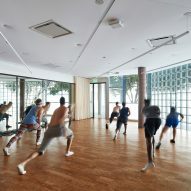 "We wanted to bring the same bespoke nuance to this very large space that we brought to the first small office we designed in Portland," said Aaron Taylor Harvey, executive creative director of Airbnb Environments. "We want it to feel like a custom home to every inhabitant." 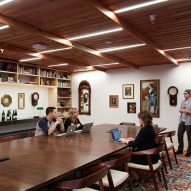 Work spaces are divided into 16 identical "neighbourhoods", each housing a meeting room, phone rooms, and large communal work tables. A space called The Castle links the floors together and is covered in pinewood strips. On the top floor is The Boat, a structural object with cubby holes for more private work. The expanded office space also includes a yoga room, personal storage areas and a wellness centre. Since launching, Airbnb has disrupted the hotel industry by allowing anyone to rent out their homes and spaces. 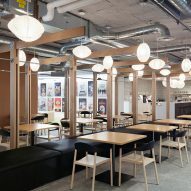 The company has therefore grown significantly and now has offices around the world, including recently opened locations in Dublin and Tokyo, as well as London, São Paulo and Singapore. Photography is by Mariko Reed.